2017 was undoubtably the year of the rookie running back. Kansas City Chiefs rookie running back, Kareem Hunt, topped the league in total rush yardage, and Jaguars first round pick Leonard Fournette’s 1000+ yard season helped power the Jaguars all the way to the AFC Championship game. The performance of LSU standout Fournette didn’t come as a surprise to anyone but one rookie running back stole the show on the way to winning the AP Offensive Rookie of the Year Award. The New Orleans Saints third round pick Alvin Kamara took home the honours after an amazing season which saw him rack up 1554 total combined yards from scrimmage and 14 combined touchdowns, with only one fumble. Could 2018 potentially see a repeat with a running back winning the Offensive Rookie of the Year Award once again? During his career at Penn State, Saquon Barkley showed a spectacular combination of ability, elusiveness, speed and intelligence. In his last two seasons, Barkley scored 43 TD’s and amassed over 3800 combined yards, production that saw him selected number 2 overall in this past draft. Quite a few players are described as a dual threat, Barkley, however, broke the mould as he was somewhat of a quadruple threat weapon at Penn state. The running back’s speed and elusiveness made him a threat in the return game, he was also a confident pass catcher with 82 receptions in his last two seasons. Barkley was also a regular threat in the wildcat at Penn State, both rushing and passing for scores. GM Dave Gettleman has done everything he can to provide the Giants offense the keys to success. The return of Odell Beckham Jr gives Eli Manning a massive weapon in the pass game, and key offensive line additions should help Manning in the pass game and Barkley in the run game. Barkley’s intelligence and ability to patiently find the gaps between the lines make him a big play threat on every play however sometimes he has the tendency to try to hard to make something out of nothing, usually resulting in 3-4-yard losses instead of putting his shoulder down and fighting for 1 or 2. Barkley’s pass protection and blitz pickup is already much more refined than most top level running backs coming out of college and that will also help Manning in the passing game. Coming out of college, Barkley bares so many similarities to Le’veon Bell and Ladainian Tomlinson and baring injuries he should be a lock for the offensive rookie of the year award. I’m expecting him to be getting 20-25 touches a game and if he produces like expected, he could be the final piece in getting the Giants back to the playoffs. The high expectations and high draft pick don’t always guarantee awards though. Saquon Barkley is in the same position Leonard Fournette was last season, and despite the incredible rookie year from Fournette, another running back stole his thunder. With that in mind, could of the other rookie running backs stake a claim? Sony Michell, Darius Guice and Royce Freeman will likely all end up in “running back by committee” systems which will heavily limit their carries this season — although Freeman could have a chance to start in Denver with CJ Anderson and Jamal Charles both not being resigned. Two other running backs who could be set up for strong rookie seasons are Seattle’s Rashaad Penny and Tampa Bay’s Ronald Jones II. Penny will likely contribute early in the return game for the Seahawks but could also state his claim to start at running back with a strong preseason. The Seahawks have struggled at running back since the days of “beast mode” Marshawn Lynch. Penny is explosive and elusive, but it remains to be seen how effective he can be behind Seattle’s suspect offensive line. Ronald “RoJo” Jones II could potentially also end up in stuck in a running back by committee system in Tampa but RoJo’s home run ability which he showed at USC could result in him leading the touches for the Buccs. Jamies Winston’s 3 games suspension to start the season leaves the Buccaneers searching for alternative weapons for their offense and if RoJo’s ability to break first contact and burn to the house can translate to the pro’s, he could become a key contribute to that offense. The AP Offensive rookie of the year award has only ever been won by Running Backs, Quarterback and Wide Receivers. So, having examined the Running Backs who are in consideration for the award, what about the QB’s and WR’s? 5 Quarterbacks were drafted in first round of the 2018 NFL Draft and in a rather surprising twist from the normality of first round Quarterbacks, we may not see any of them start in the NFL this season. The Bills traded up to take the strong-armed Josh Allen but also acquired A.J. McCarron in the offseason. They also still have Nathan Peterman in the QB room, the man who they put in after benching Tyrod Taylor. Similarly, the Cardinals selected Josh Rosen early in the first round as their Franchise QB however they also acquired former first round pick, Sam Bradford, who would likely be considered their starter. Former USC man Sam Darnold again is another early first round who may not see much of the field in his rookie year. The Jets renewed the contract of Josh McCown this offseason and acquired former first round pick Teddy Bridgewater in free agency. If Bridgewater can return to the level he showed prior to his injury, he would be guaranteed starter in the NFL, but after nearly two full seasons out that remains to be a big if. Two of the rookie QB’s who have a possible chance of OROTY are the Browns’ Baker Mayfield and the Ravens’ Lamar Jackson. Mayfield has a major battle on his hands to win the starting job off free agent signing Tyrod Taylor. Taylor lead the Bills to the playoffs last season and has already established himself as a leader in Cleveland after financing an unofficial pre-training camp in LA for the browns offense. Heisman trophy winner Mayfield doesn’t lack the skill or ability to challenge for that starting role and if he gets it he will have one of the NFL’s most exciting offenses at his disposal and ultimately very low expectations of success. With Carlos Hyde, Duke Johnson Jr. and Nick Chubb in the backfield and David Njoku, Jarvis Landry and potentially a prime Josh Gordon catching passes, whoever the Browns starting QB is they have the potential to put up some great numbers this season and if the browns could get even as little as 3,4 or 5 wins its still a massive upgrade over the past two seasons. If, and it’s a big if, Mayfield leads the team to that kind of season, I’d expect him to be in with a strong chance of winning OROTY. Lamar Jackson is the least likely of all the first-round rookie QB’s to start, so why does he have a shot at OROTY? It’s a longshot but there’s a strong chance that Lamar Jackson contributes in many ways for the Ravens offense this season. Training camp is still very young, and we’ve already seen videos of Lamar Jackson and Joe Flacco on the field at the same time and it’s very possible the Ravens put together a unique wildcat offensive system which can utilize both players and create confusion for opposing defences. Prior to the draft, some questions were asked about whether Jackson would switch to receiver in the NFL and while he insisted he was committed to playing Quarterback, it wouldn’t surprise me if we saw Jackson catching passes, throwing pass and rushing the ball on a regular basis this season. If Jackson can find a way to regularly contribute in a variety of different ways as the Ravens end up having a successful season, we could see Jackson with OROTY with one of the more unique rookie seasons in NFL history. 2018 was a relatively weak class at the Wide Receiver position. D.J. Moore and Calvin Ridley were the only two first round receiver picks in 2018 and both are likely set to play a supporting role in respective offenses this season. Moore will likely be Cam Newton’s 4th choice read behind Greg Olson, Christian McCaffrey and last seasons breakout player Devin Funchess whereas Ridley will have Julio Jones and Mohammed Sanu to compete with for catches. Baring injuries to some of the aforementioned players, it’s highly unlikely any of these players dominate in their rookie season but a couple of under the radar receivers have a chance to cause a few shocks and come from lower in the draft, much like Alvin Kamara last season, and take home the Offensive Rookie of the Year award. Situations often play a massive part in a rookie players success. Deontay Burnett is a player who is taking advantage of a strange situation. The Tennessee Titan’s draft class featured just 2018 and WR was a position they couldn’t address in the draft. One of their undrafted free agent pick ups was former USC man Deontay Burnett and he’s already making waves in training camp. A smart, savvy route runner who was known in college for his safe hands and versatility playing inside or outside mean he has all the talent expected of an NFL receiver, his lack of explosive speed and average size likely detracted from his NFL draft value. Burnett has already been taking first team reps in Tennessee and should he continue to show value, he could find a role for himself on one of the NFL’s weaker receiving corps. Burnett certainly isn’t shy of the big stage. The 2017 Rose Bowl, a game dominated by Penn State’s Saquon Barkley no less, Burnett finished the game with 164 yards and 3 scores, including the game tying TD late in the forth. Burnett finished the 2017 season with 1114 receiving yards and 9 scores and will no doubt of headed into training camp with a chip on his shoulder after going undrafted. 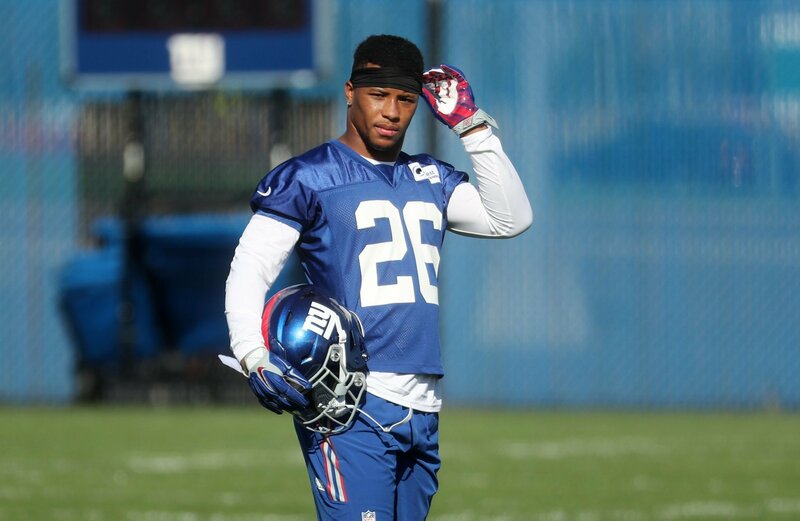 With all the expectation on the shoulders of Saquon Barkley, can the second overall pick carry that weight of expectation to success? He is arguably one of the best running back prospects of all time and there should be a lot to come from him this season, but if he can’t meet those expectations, there’s a lot of exciting young talent ready to steal the show this season.